Some dead trees were removed, but others were left standing. The Emerald Fire, which started on Oct. 16, 2016, burned 176 acres. Ten acres are being replanted this spring, with more to come in the following two season. 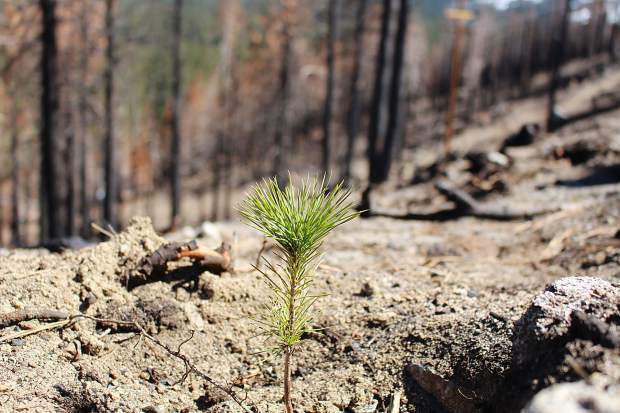 The Sugar Pine Foundation has planted 800 seedlings in the burn area off of CA 89 near Cascade Road. Seedlings have about a 45 percent mortality rate at this stage. 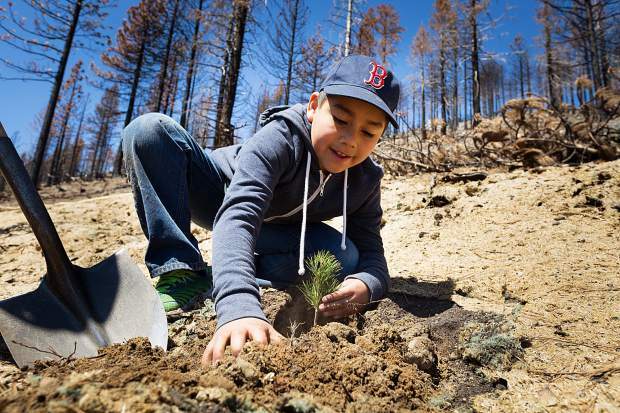 It’s been seven months since the Emerald Fire burned 176-acres of forest on the South Shore, and reforestation efforts are already underway. 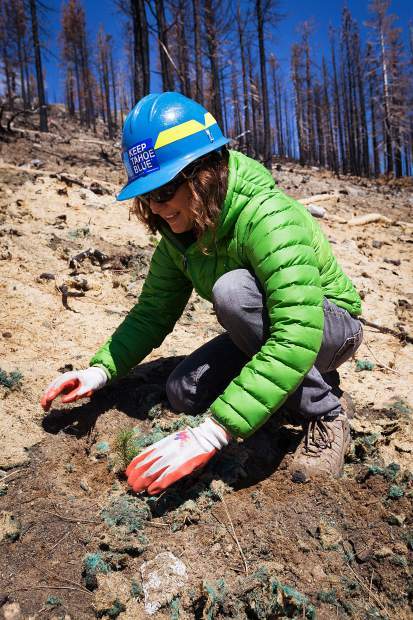 Under the guidance of the U.S. Forest Service Lake Tahoe Basin Management Unit (LTBMU), volunteers with the nonprofit Sugar Pine Foundation have supplied and planted approximately 800 six-inch Sugar Pine seedlings over the past two weekends. Other native conifers, including Jeffrey Pines and Incense Cedars, have also been planted by LTBMU in areas along California Route 89 near Cascade Road. 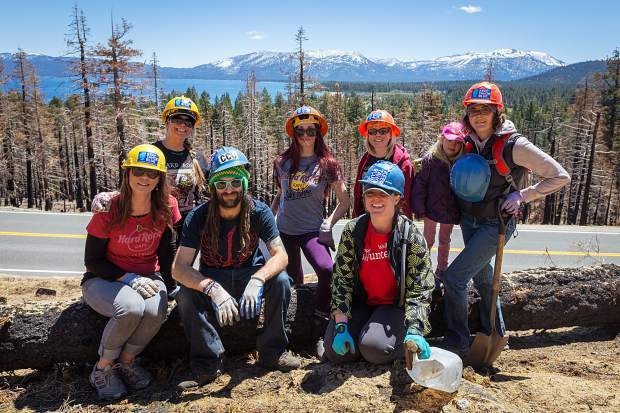 “We have a very short window for when we can plant seedlings in the Tahoe Basin,” said Paul Guarnaccia, LTBMU assistant silviculturist and organizer of the reforestation effort for the Emerald Fire. Moisture levels, temperature and competition from the regrowth of brush can all factor into a seedling’s survival, which has an average mortality rate of 45 percent in the early stages of stand reestablishment. The plan for the reforestation of the area, which was released by LTBMU on April 17 for public comment, is to plant 10 acres with seedlings this spring, up to 50 acres next spring, and up to 15 acres in 2019. About 300 seedlings are planted per acre. “The idea is not to replant every acre. 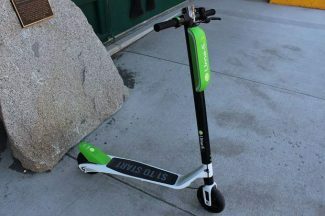 It’s to replant the bulk of the acres that had trees on them, but we also want to allow some areas that were originally brush to come back,” explained Guarnaccia. While many of the dead trees were removed by CalTrans shortly after the fire, others have been left. Some of the burned trees still have a chance of surviving. Due to the intensity of the burn, however, natural tree regrowth is not likely for the area. 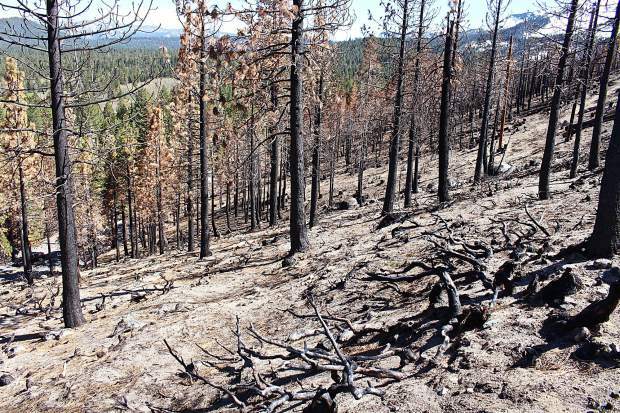 “Usually you have a seed bank that comes back naturally, but because of the severity of the burn, a lot of the trees’ crowns, where the cones would be, were completely consumed so that natural seed bank doesn’t exist,” said Guarnaccia. It will take anywhere from 100 to 125 years for the area to return to what it once was. The Emerald Fire started on Oct. 14 and burned 96 acres of National Forest land, 79 acres of private land, and less than an acre of California State land. 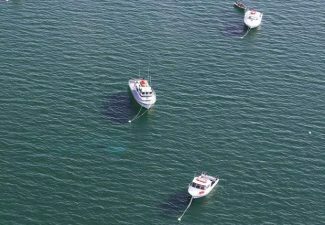 It forced the evacuation of over 500 people for several days, though no structures were damaged and no fatalities occurred. The official cause of the fire was the ignition of a live green tree, which snapped due to high winds and fell through power lines. “It was one of those storms where right before it gets really windy, then it starts snowing, so our guys were putting out hot fire with 20-foot flame lengths and getting snowed on,” said Jacobson. By Oct. 17, the fire was 100 percent contained thanks to the efforts of multiple firefighting agencies throughout the basin. 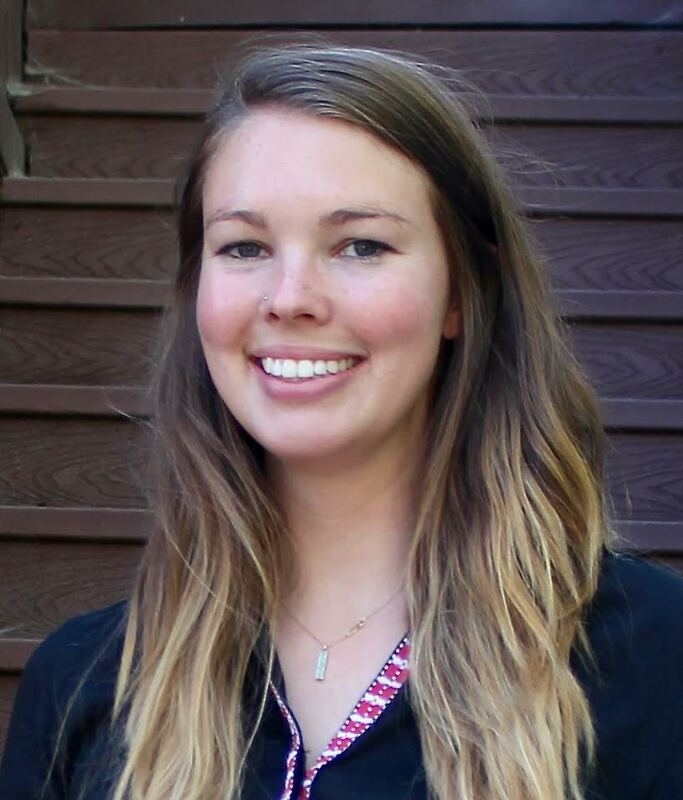 For Jacobson, the Emerald Fire solidified that the collaborative effort to firefighting and fuels management in Lake Tahoe is the right approach. “Even if as an agency the Forest Service were out doing hundreds of thousands of acres every year, if the private land right next to the Forest Service land is not treated, if the state land next to the Forest Service land isn’t treated, it makes all of our treatments less effective,” said Jacobson. The Tahoe Fire and Fuels Team, formed in 2008, includes representative from Tahoe Basin fire districts, CAL FIRE, and other agencies from both California and Nevada. The team works to prioritize prescribes burns and fuel reduction operations by pooling resources. 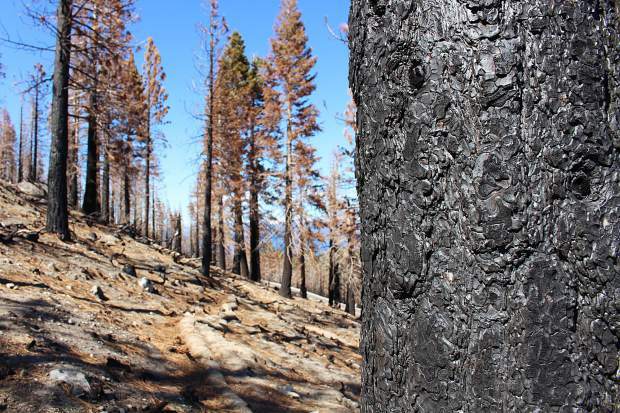 But no matter how many preventative measures are taken to reduce the severity of wildfires, the fact remains that the Tahoe Basin is a fire-dependent ecosystem. 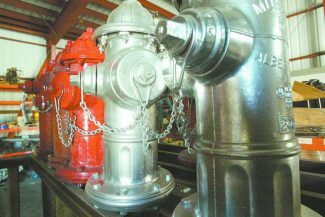 “Even with the work we had done in here, there is nothing you can do to prevent this in some respects,” said Guarnaccia.